"A university going bust is more likely than at any other point in the last generation". These were the words of Nick Hillman - former advisor to Tory universities minister David Willets. Three universities across Britain have been found to have been facing bankruptcy, often relying on short-term loans to keep themselves above water. marketisation of our education system. With universities now reliant on attracting enough fee-paying 'customers', in the form of students, those struggling to enrol enough people face potential ruin. 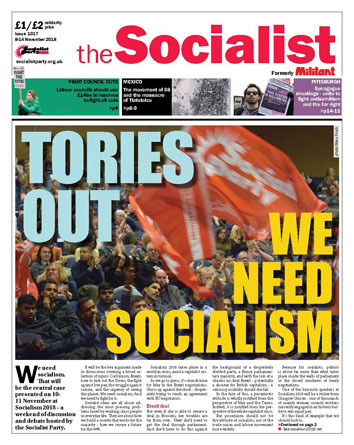 Past Tory and Blairite governments have consistently pursued a policy of gradual backdoor privatisation of universities, selling education as a commodity to an increasingly debt-burdened clientele of students. We need to be clear: if higher education is run on the basis of the market, a crisis of this sort is bound to happen. Education is not a commodity to be modelled on the endless and ruthless profit-seeking of the capitalist system. 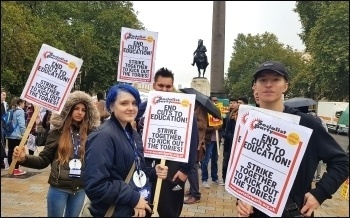 The recent University and College Union and Unison ballots for strike action against declining pay and gender inequality in the workplace is part of the same struggle to save our education system. Despite action being blocked by Tory anti-union laws, the majority votes for action show the appetite that exists for a fightback. Students and staff are both under threat from a government that is determined to dismantle and sell off higher education. Now is the time for a mass mobilisation of students and staff together, demanding publicly owned and fully funded universities as part of a plan to unseat the Tories and their rotten big business agenda.